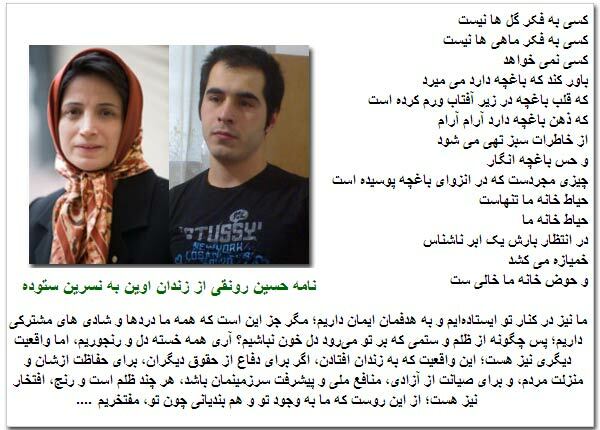 Jailed Iranian blogger Hossein Ronaghi Maleki has issued a letter of solidarity for Nasrin Sotoudeh, the jailed Iranian lawyer who is on a hunger strike in protest of her mistreatment in prison. The Kaleme opposition website reports that Ronaghi Malki addressed his letter from Evin Prison to Sotoudeh, writing: "Despite all these pains, there is another reality; the reality that while it is unjust to be imprisoned for defending the rights of others and protecting human dignity, freedom, national interests and the progress of our land, it is also an honour, so we are honoured to have cellmates like you." Ronaghi Maleki goes on to write: "One day in this very prison you told me that you have faith that what we are doing is not futile, that our path is right and will come to the right end. You said all our pains will bear fruit; you said in this world of expanding communication, no secret will remain uncovered, that victory is ours. You told me of Ang Saan Suu Kyi and other freedom fighters and all those who suffered for long but resisted but did not lose faith in the onslaught of disappointments." "What is certain," the jailed activist concludes, "is that deception, lies and oppression have become a blunted tool, and the people's awareness has destroyed the weapons of threat and deception. Finally the foundations of cruelty will fall, oppression will end and freedom will dawn." Ronaghi Maleki, who was arrested following the 2009 election protests, was released in July of 2012 on heavy bail after 32 months in jail including several hunger strikes. He was arrested again, however, while volunteering in an independent relief camp in Eastern Azerbaijan and offering aid to victims of the deadly earthquake that killed hundreds of people in August. He is sentenced to 15 years in jail. Nasrin Sotoudeh has also been in jail since September of 2010 and is currently on a hunger strike in protest of the violation of her rights as a prisoner.